With a name like Joseph's Coat for this quilt block, well you know I just had to make it a scrappy version with lots of colourful fabrics. The block features a light background fabric and is anchored with a dark fabric in specific locations, to give the eye a rest from all of the colours. This block is technically a five patch as it is built on a 5 x 5 grid. However, it is constructed as an uneven nine patch due to the placement of the cut pieces. The use of both half square triangles and quarter square triangles are necessary in order to keep bias edges away from the outer edges of the patches. As a bonus you also get to practice your square in a square patches. 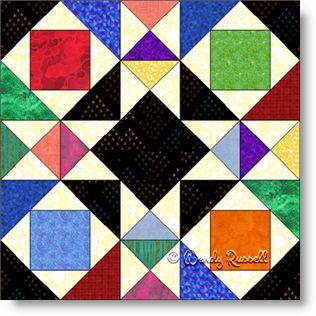 I had such fun creating the sample quilt layouts that I have illustrated four different variations for your enjoyment!